December 2015 – Gina Diamond's Flower Co.
December 12, 2015, posted by Gina – These cookies aren’t just for Christmas but because they are no-bake they are easy to prepare during this busy time. These are my absolute favorite cookies and everyone else seems to loves them too! I have seen this recipe in many cookbooks but someone gave this one to me a while back. In a small saucepan bring sugar, milk and butter to a boil then turn the heat to low. Stir until all the sugar is dissolved. In a large bowl, combine the oatmeal, vanilla and cocoa. Pour the sugar mixture in the bowl and stir until well combined. Drop by teaspoonful onto a cookie sheet. Cookies will harden as they cool. That’s it!! I usually prepare these the day before I need them so that they have a chance to harden. December 11, 2015, posted by Michelle – Bonjour! I am spreading a little cheer from across the pond and hope you like this Christmas tree collection. These trees are part of the annual *Les Décos du Cœur event in Lyon and they are sponsored by companies throughout the region. People can participate in a drawing this weekend to win various prizes and the trees will be auctioned off on Sunday. The proceeds go to a charity that helps the elderly in need. A few of these trees were decorated with a distinct French flair: the red, white and blue tree, the Olympique Lyonnais soccer team tree and the tree with macarons in transparent ornaments – that one was also topped with a chef’s toque in lieu of the traditional star. December 11, 2015, posted by Gina – This week I went on a search for quick and easy weeknight recipes to make during the busy holiday season. 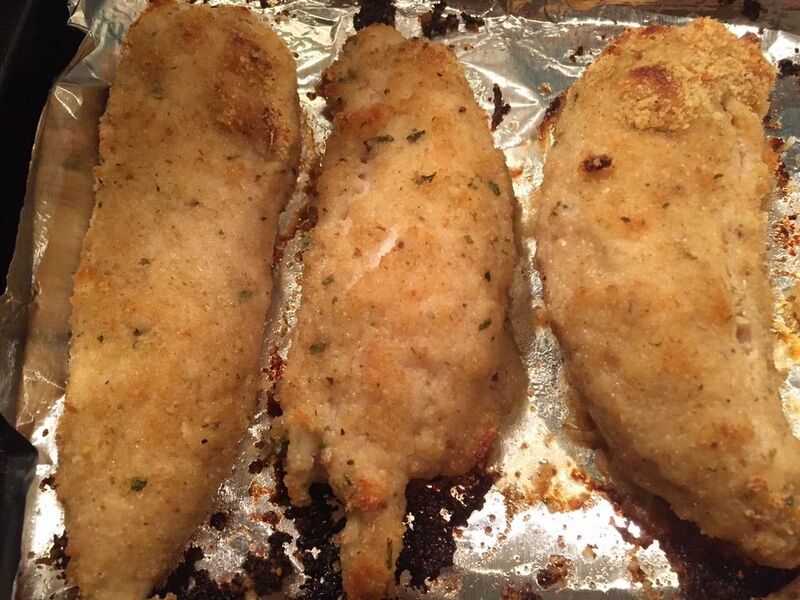 I came across one for homemade chicken tenders and one for tortellini soup. These probably don’t sound so special but they have a secret ingredient that makes them outstanding: Balsamic Vinegar. A while back I caught an episode of Everyday Italian and Giada De Laurentiis was making crunchy parmesan chicken tenders (click HERE for the recipe). What I really liked about them is that they are baked, not fried, and they are indeed easy to prepare. You soak them in buttermilk and cover them with a combination of bread crumbs and parmesan cheese and then you bake them. But what I wasn’t expecting was the flavor punch the balsamic vinaigrette gives to these. Word to the wise: if you have teenagers or younger children chances are they will still want to eat these with ketchup. My almost 18 year old would not even try the balsamic sauce but he did brag about how good the chicken was. Further, he has a t-shirt that says “I eat ketchup with my ketchup”, so how could I convert him? The next night I needed to whip up something fast, so I grabbed one of my favorite cookbooks that never disappoints, Tables of Content. 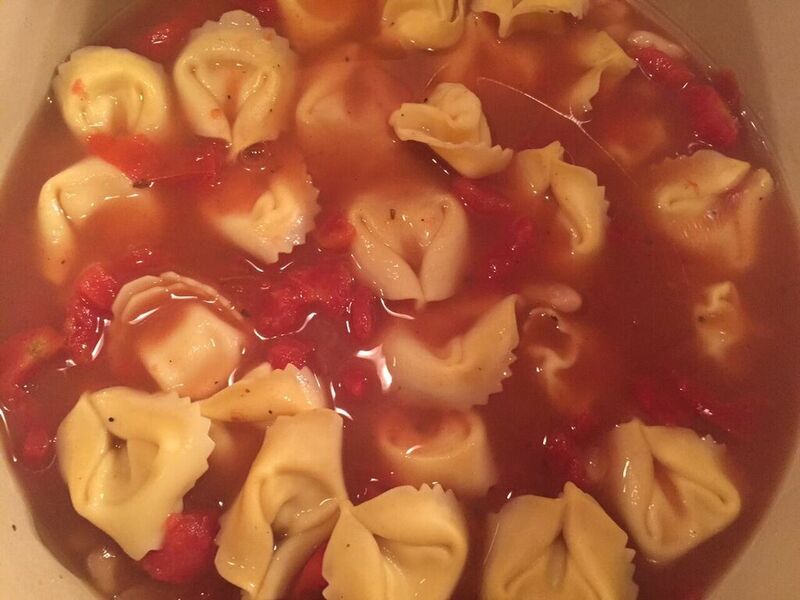 I found a recipe for tortellini soup which calls for, you guessed it, balsamic vinegar. My husband absolutely loved this soup and for a recipe that takes just 15 minutes to put together it is a clear winner. I hope you enjoy these as much as we did. Bring the broth to a boil in a stockpot over medium heat and add the pasta. Cook for 4 minutes and stir in the beans and undrained tomatoes. Reduce heat to low and simmer for 5 minutes, stirring occasionally. Remove from the heat and stir in the basil, vinegar, salt and pepper. Ladle into soup bowls and garnish with Parmesan cheese.